Just the word 'refreshment' can get me excited. But not only food and drink can refresh us. People can. Last week, Mother had some special visitors from east Texas come see her. That's Janet, Mother, and Cindy. They all used to teach school together in Van. Their classrooms were all next to each other... so they have lots of memories to share. Plus, they'd hang out a lot together when they weren't in school. Speaking of refreshment, a good laugh is that. about the value of laughter. 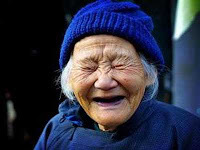 Here's The Laughing Cure, with quotes on laughter. And here's the Benefits of Laughter article. And take my poll (upper right), if you haven't. Thanks!